Oh wine, how I love thee. And how I love the anthropologie-rumpled look of this cotton-linen blend Heather Ross fabric for a gift like this. I imagine toting it to the park for a picnic where all the ladies are wearing forties-inpired high heels while casually sipping Malbec as the sun sets. And remember to leave a comment, because our favorite commenter is winning that super cute key fob set! to your project. I love the anthropologie-rumpled look of this fabric for a gift like this. Now let’s make the bag. So cut a piece of fabric 12″ X 17″ and fold it in half right sides facing so two 17″ sides are aligned. Add a gift tag, a bottle of wine, and maybe a few pretty wine glasses. Done! Nice way to spruce up a simple gift right? I want to go on a wine-drinking picnic right now. But I will also need a snuggie because it’s way too cold for a wine-drinking picnic. Ok….I know I'm obsessed when I start to dream about the bias tape maker! Seriously!…I dreamt about the BIAS TAPE MAKER! In my dream I was all giddy making tape and grinning from ear to ear! I woke up all warm with happy thoughts… then realized I am still ironing bias tape like some kinda chump! This is going on my to do list I think they would make great gifts. I just married into a Wine Drinking Family. This will be a great Christmas gift. Thank you! Thank you for such an easy tute! I can totally handle this one and its such a great gift idea…no way anyone is getting one this year…but next year I am going to start making Christmas gifts in July. Lovely! And I LOVE those wine glasses! I have been looking for some like that, where did you find them? the tote is adorable, but the GLASSES! oh, i like those. Ok so what do you do with a wine bag after I'm not a wine drinker so I've never received a wine bag, but know lots that do, I just don't want to make something that they can't use again. I hope someone brings me one of these with a bottle of bubbly post baby. There's nothing quite as exhilarating as sneaking booze in the hospital! I love the fabric choice. I love the handle. So much cuter than just a plain fabric sack with a ribbon tied around it. Also, along the same lines (or maybe this comment belongs in the Christmas trees post?) I saw a cute wine "sleeve" for sale somewhere. I was made out of the sleeve of a thrifted sweater, and there was a teeny knitted scarf tied around it. The sweater sleeve had cuffs and buttons. I think you would just cut the sleeve off as long as you wanted and then sew it up straight across the bottom, preferably serged I'd think. Gift for mama (wine) and for kiddo (doll scarf), because what is better than knocking out two gifts with one. Anthropologie-rumpled is now my new favorite phrase! "Of course I didn't run out of time to iron my shirt, between packing a day-care bag, three lunches and managing to feed small people this morning– I'm simply rocking the anthropologie-rumpled look today." Great tute and will be making a bunch of these for last minute gifts that I am always struggling with! Thank you! This is too cute! Please, please, invite me to the picnic at the park so I too can sip Malbec with the ladies in their vintage 40s gear! Along with those Dixie cup-style wine glasses one can buy, this is one of the best ideas for wine gifting I've seen in the present-themed, holiday season blogosphere. I'll post a link on the Facebook page for our Wine Spectator-applauded 2006 Napa Valley Cabernet – I think a homemade bag would be perfect for gifting bottles of this fine, rich vintage. Thanks for the post! I just made this cute little bag. I needed to make something quick to bring a bottle of wine over to family’s house for Easter! It was super quick, and it turned out great! Thanks! Thanks! I used these instructions to make a gin cozy! I doubled the fabric with a contrasting color. I saw this tote and thought it would make a great starting bag for my knitting projects where I’m using long needles. Or even just a great storage solution for long needles – just hang it up out of sight, but I’ll always have my needles together. Just whipped one up then! Love it! So quick and easy, and a great gift idea! Thank you so much for posting this pattern. I made one tonight as a hostess gift for a get-together with friends tomorrow – I bought the wine this afternoon but did not have a gift bag for it… found your pattern on line this evening and made it with scraps from my stash. So easy and it looks great! Thanks again. Thank you for this. I have been looking at patterns for these all day. All were way too much for a simple project; I just wanted a quick one to make for some Christmas gifts. Yours will be perfect! Thank you so much for this great tutorial! I just made my first wine bag using your instructions, and it worked just perfectly. I’m so excited to bring this unique gift to our friends’ housewarming! awesome! we would love to see a pic! Love this! I bought a bottle of wine for a friend and wanted to make it even more personal. 🙂 So I made this today! It’s not super stiff as it’s quitlting fabric, but it’ll be perfect to present to her! Thanks! Oh, awesome! 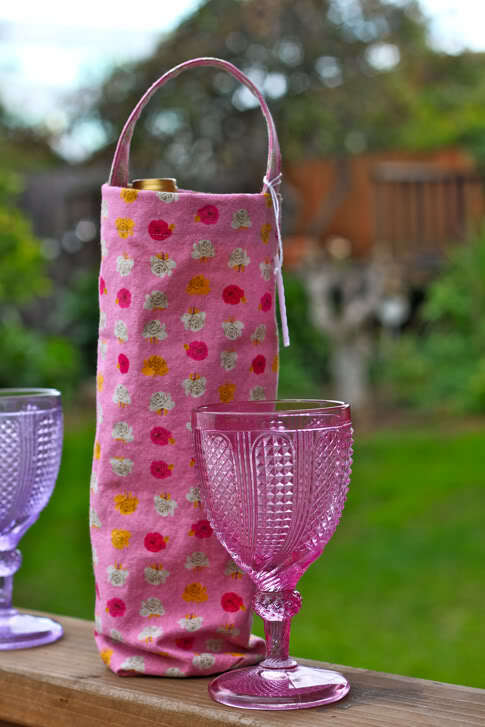 We would love to see a picture of your wine bag! Quick tip – add an inch for champagne! It was a bit snug! A very easy pattern – I made 4 in a single afternoon!